A computer that measures bicycle rides with impressive precision is coming soon to Android. 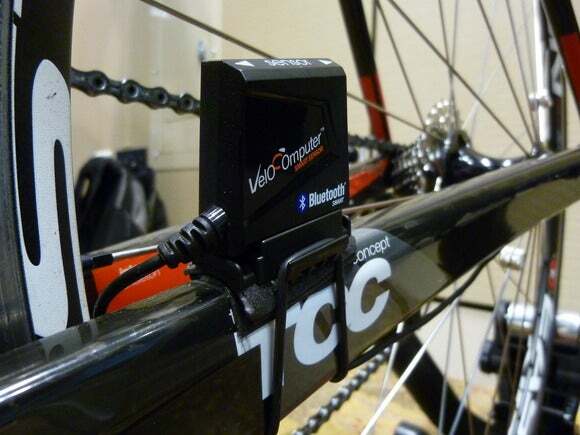 The VeloComputer from SoundOfMotion Technologies consists of a sensor positioned near the rear hub and a small computer unit mounted on the frame. The sensor can measure the distance traveled down to the centimeter—much more accurately than GPS—and also the inclination of the road to a single degree. The result is a more detailed profile of a bicycle ride and a measure of the power output by the rider during the trip, the company said Wednesday at the Demo 2013 conference in Santa Clara, California. The computer communicates with a smartphone using Bluetooth Low Energy, an energy-efficient version of the short-range networking standard supported in version 4.3 of Android. The phone records data from the sensor, which can then be exported to popular training apps like Training Peaks, Strava, Garmin Connect or to any software that supports the FIT format. The full sensor costs $149, and a forthcoming basic model will cost $79. The iOS app is already available and SoundOfMotion announced Wednesday that the Android app will be available soon.